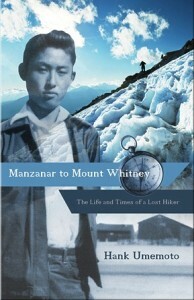 GARDENA — The Manzanar Committee will honor Hank Umemoto, author of the newly released book “Manzanar to Mount Whitney: The Life and Times of a Lost Hiker” on Sunday, March 17, at 12:30 p.m. at the Merit Park Recreation Room, across the street from 56 Merit Park Drive in Gardena. Umemoto, who was born in 1928, grew up in Florin, near Sacramento. At the age of 14, he was sent to Manzanar in California’s Owens Valley, one of ten American concentration camps where over 110,000 Americans of Japanese ancestry were unjustly incarcerated during World War II. After Manzanar, Umemoto struggled, to say the least, spending over three years on the streets of Skid Row. But he endured, finishing high school and attending Los Angeles City College before serving with the 38th Military Intelligence Service during the Korean War. Upon his return from Korea, he attended California State University Los Angeles, married, raised a family, and eventually ran a print shop for 32 years. In “Manzanar to Mount Whitney,” Umemoto shares memories of his childhood, his time behind the barbed wire at Manzanar, and his life after camp. For information on the book, contact Heyday Books at (510) 549-3564 or visit www.heydaybooks.com. Hi Hankj. This is a voice from the past. I am Richard Brown and I met you at the Piaute Indiane Reservation in Independence California, You took me on a tour of Manzanar and we shed a tear over the injustice that was done, I met your family and you were living in a motorhome, I was just telling my friend Carol, whose email I am using about Manzanar and your part in the Archeology that Manzanar. I was the young man who was telling you how I felt about all the injustices that the white man has put on the Indianians, Japanese and other races. I had recently received a death sentence as I suffered fromn Cancer and we shared a common thread, You were staying in The Piute Indian Reservation Campground and we helped each other acclimate to the campground environment. You left a mark on my life and I still love you for what you have accomplished at Manzanar. I appreciate all the things you did for me at Manzanar. If you remember me you can answer my comment to the email address above and my friend will get the message to me. There will always be love in my heart for you and your family and injustices you overcame. Thanks for the memories, Richard Brown.